Ermmmm 4 months, hello where has the time gone?! I know I keep saying this on every monthly update but seriously?! I cannot believe my baby boy is now 4 months old! So last month I told you guys how naughty I’d been not having Max weighed for quite sometime. Well he’s now an impressive 20lbs, what a chunk! Everytime I visit the baby clinic to have him weighed the health visitors gasp in amazement at how big and long he is. He was born on the 98th percentile and is now on the steady 91st percentile line. He’s yet to double his birth weight which was 10lbs 8, but he’s so close to it. His legs and arms now have an extra roll and I spend countless hours kissing and biting them, yummy! Routine has been my major agenda this month trying to drop that dreaded 4am feed. What we decided to do was try out a dreamfeed at 11pm and it’s worked wonders. He now goes down between 6-7pm, dreamfeed at 11pm and he gets up anywhere between 6-7am. On the odd occasion he has woken at 5am for a cuddle and if he’s thirsty I’ve given him water. I then try and get him down again for the rest of his nighttime sleep. My main issue at the moment is trying to make him last in the late afternoon before bedtime. He’s usually so exhausted and itching to go down to bed at 5pm! He’s a brilliant morning napper but hates going down for naps in the afternoon. If you have any suggestions on how to make Max last longer in the afternoon before bedtime that would be brilliant. Max is now having food! And let me tell you he absolutely loves it! You can see from this pic I posted on my Instagram. He now has one meal a day he’d have two if I Iet him but I want to take it slow. During his short morning nap I prepare his brekkie which is either porridge or mashed up banana. He especially loves mashed up banana mixed with a little bit of his milk. I’ve also tried him on a few Ella’s Pouches which he LOVED! I made a sweet potato purée using my baby bullet but he hated it 🙁 I’ve stopped using the pouches for the minute as I really want him to like my cooking, so I’m going to stick at it. In a few weeks time I will be introducing another meal probably at around 3pm. He’s currently drinking 8oz every 2-3 hours with a dreamfeed at 11pm too, so he’s definitely ready for another meal. But let me tell you one thing I was not ready for the smelly explosive poo’s woweeee he pooed 3 times in one day last week, I couldn’t believe it! Max is now fully in 6-9 month clothing, I packed away his 3-6 month clothing yesterday and actually cried because he’s growing far too quickly! I’m sure he won’t be in 6-9 for long so I’m now buying his 9-12 month clothing. I’m loving that it’s cooler now so I can put Max in cute hats, leggings and long sleeve tops. I hated the heatwave as all his beautiful clothes went to waste, he pretty much lived in his nappy and sleeveless vests! The only negative is that Max hates getting dressed he literally screams unless we play peak a boo. He is now a roly poly and wants to twist turn and ends up on his front. He’s doing this is his cot now before he goes down for naps and bedtime. I have to keep a close eye on him as he cries when he’s on his front. Max is now a side sleeper, he hates being on his back so I have to prop him up using a blanket or his jelly cat bunny. I’m quite happy about him sleeping on his back because I’m so scared he’ll develop a flat head if he’s always on his back the whole time. I’ve also found making him laugh is so much easier now. Sometimes he’ll just look at me and burst out laughing! He’s started making fart like noises using his tongue. He honestly won’t stop! It’s so funny when we’re in town and he does this as people think it’s me! Max is really into toys now, he loves his wooden toy cars, he has so much fun playing with these when he’s sitting up on his highchair. He’s also started grabbing things and putting them in his mouth. He’ll grab pretty much anything from my hand to my iPhone! He’s also dribbling a lot which is probably down to teething so I’ve stocked up on dribble bibs. There’s still no bottom teeth yet, but I’m hoping one will sprout soon, hopeful it’ll mean his teething pains ease a little. We’ll see. So that’s it for this months Max update! I cannot express to you all how much this little boy means to me! As each month goes by he amazes and surprises me even more. He’s such a clever baby! Writing these monthly updates isn’t just for you guys it’s also a great way for me to read back and see how much Max is developing and changing. I can’t wait to show him this when he’s older! 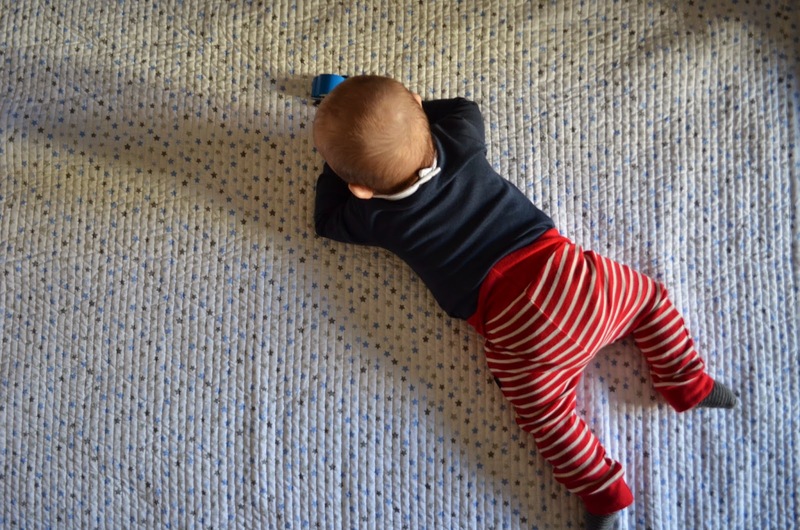 This is a LOVELY way to document the milestones – and yay to sleeping through the night!